Hello, We are the Panos! Steven Pano is a man of many identities: When he is at a medieval event, he is Ewen Ericsson, proprietor of Longship Trading Company, or sometime (at Pennsic War) the Red Headed Wench general store, At French and Indian War events, he is Etienne Pano, of Etienne Pano et Fils, in the Revolutionary War he is Steven Pano of Pano and Friedenthal Sutlers, at a Black Powder Rondezvous he goes by Ivan the Mad Russian of the Russian American Trading Company, at a Pirate Festival, he is the Quartermaster of His Majesties Ship RANGER, and at a Civil War event he is the proprietor of the Old Dominion Mercantile. But all of them fall under the banner of Ranger Reproductions. 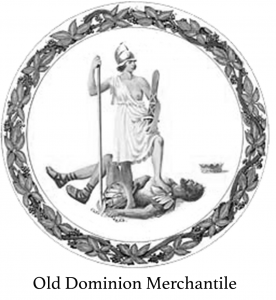 From the Fall of Rome to the Fall of Richmond, the store for reenactors. He started reenacting on Lexington Green on April 19, 1975 for the start of the bicentennial celebration. He began his career as a historic vender in Whitensville MA the same afternoon. Since then he has expended into other time periods, but always with an eye towards providing the most accurate materials at the most reasonable price. On almost any given weekend, he can be found in his store, somewhere near the east coast, with the appropriate merchandise for whatever time period he is representing. The store is easy to find due to the historic candies in the front and the big brass ball finials on the top of his tent. 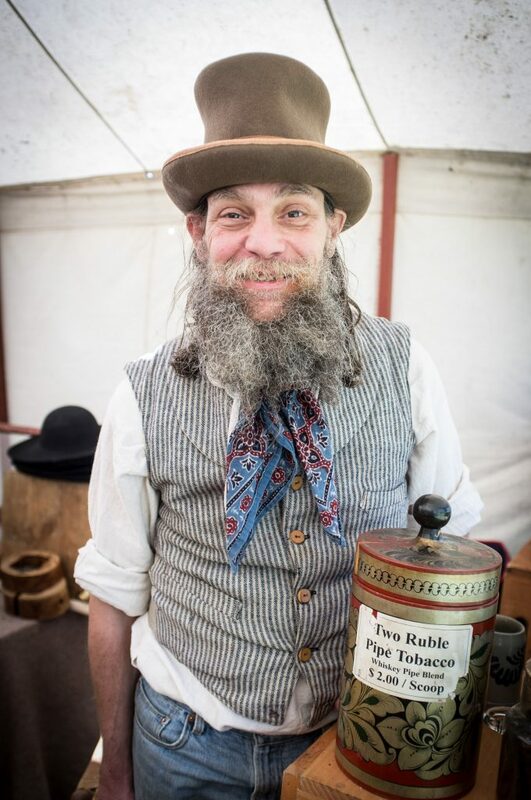 He is a wealth of knowledge about the items he sells and can tell you the history and some funny stories about just about all the items he carries. If you leave the store having learned something, he feels he has done his job! Ruth Pano met Steven at Pennsic war 14. They become friends but it stayed as just friends until the Battle of Great-bridge in 2012, when they suddenly realized they actually liked each other. Having agreed that neither EVER wanted to remarry, they started dating, only to find themselves choosing rings about 3 months later. 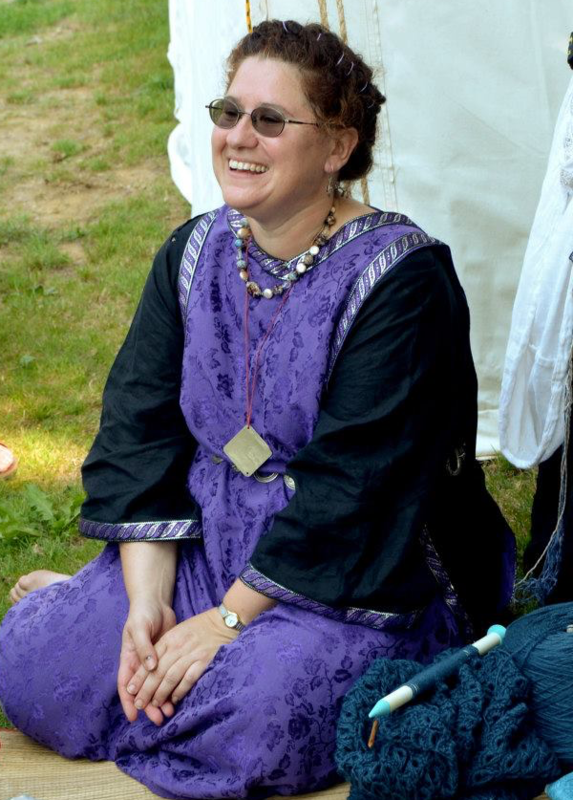 Ruth, or Lady Miriam as she is known in some of the reenactment circles, runs Miriam’s Yarns and Fibers. The business specializes in natural fibers for re-enactors and crafters, and includes linen, cotton, silk, hemp, nettle, cashmere, and wool. She also specializes in used silk and cotton saries, which serve as wonderful and affordable material for clothing of any time period.